Yankee Stadium on Wednesday. Photo by Jason Schott. 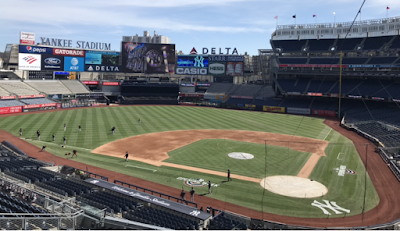 The Yankees will open the 2019 regular season at Yankee Stadium on Thursday with a 1:05 p.m. game against the Baltimore Orioles. All Yankee Stadium gates will open to Guests with valid tickets beginning at 11:00 a.m. The presentation of colors will be performed by West Point Cadets, while the national anthem will be sung by actor, vocalist and native New Yorker Aaron Tveit — who is slated to star in Broadway’s Moulin Rouge this summer. Continuing the homestand on Sunday, March 31, is Calendar Day presented by Mastercard, with the first 40,000 Guests in attendance receiving a Yankees calendar. The Yankees’ Monday, April 1 and Tuesday, April 2 games vs. Detroit are scheduled to begin at 6:35 p.m., the first of 13 weekday games in the first two months of the season with that start time. All Stadium gates will open 90 minutes prior to the scheduled first pitch for 6:35 p.m. games. Additionally, the Wednesday, April 3 game vs. Detroit is slated for a 4:05 p.m. first pitch, with Stadium gates set to open at 2:30 p.m.
For a list of ticket specials, including game dates, seating locations, and terms and conditions, fans should visit www.yankees.com/ticketspecials. Please note that all ticket specials are subject to availability. For further information and details on parking and public transportation options to Yankee Stadium, please visit www.yankees.com and click on the Yankee Stadium tab at the top of the page.